The Folsom Parks Commission would like to hear your ideas! The Recreation Board meets the 2nd Tuesday of each month in Borough Hall at 7:00 PM. Through a combination of grants and some Borough funding, the Folsom Parks Commission has been able to facilitate a number of enhancements for our parks over the years. These improvements included, but are not limited to, the creation of new ball fields, the addition of lights to existing fields, installation of fences, the construction of a walking trail and the replacement of old playground equipment with new safe and modern playground systems. The Parks Commission would like to hear from you, our Folsom residents, with your ideas about what our parks need for the continued enjoyment of our residents and children. Even though funds are hard to come by, we will make every effort to find a way to do what you feel is needed. So please email your ideas for park improvements to parks@folsomborough.com or just leave a note for Ron Esposito at Borough Hall. For years players had no relief from the hot sun and rain showers during baseball games played at the senior boy's baseball field located at one of Folsom's parks near the Folsom Elementary School. Up until now, this baseball field was without dugouts. We are all happy to report that this situation has been remedied. Through the efforts of Folsom Mayor Louis DeStefano, the Folsom Borough Council and the Folsom Park Commission the players utilizing the senior boy's field have been enjoying the comforts of dugouts that have recently been built. At the beginning of the year, the Mayor made the construction of the dugouts at this field a top priority. A budget was provided and the Folsom Park Commission agreed, at their first meeting in January, to take on the challenge to get it done. 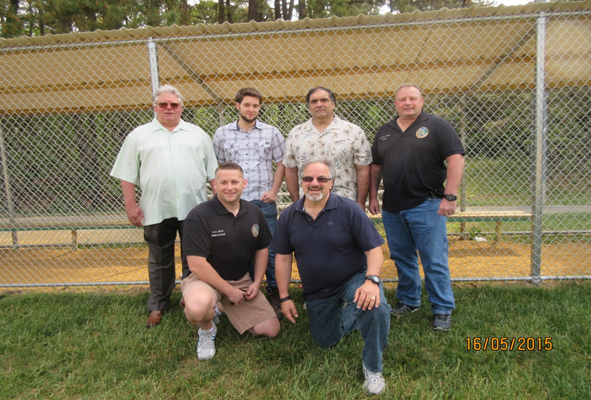 Utilizing a competitive procurement process approved by Borough Council, the Park Commission was able to have the dugouts constructed relatively quickly and at a reasonable cost and in time for use this season. On May 16, 2015, the Folsom Mayor, available members of the Borough Council, and available members of the Folsom Park Commission gathered for a photo in front of the new dugouts. Present in the photo are (left to right) kneeling Councilman and Council Park Representative: Kyle Smith, Park Commissioner: Ron Esposito; standing Councilman and Park Member: Kenneth Jantz, Park Member: Ryan Krueger, Councilman and Council Park Representative: Charles Arena and Mayor Louis DeSefano.